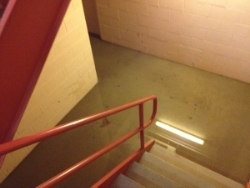 Rocky River, OH- An improperly installed sprinkler system apparently caused over 500 gallons of water to flood this award winning country club causing approximately $150,000 in damage. Platinum Restoration's cleaning department were able to save countless pieces of furniture as the fire suppression system team was shut down. 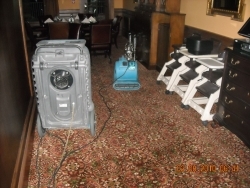 The team then quickly mitigated the water damage to prevent further damage to the property. Within 4 days, Platinum Restoration and its partners were able to perform repairs that would allow this commercial kitchen and dining room to be back in operation for an event the upcoming weekend. We did two losses at this facility. First loss was from heavy rains and flooded whole first floor wing. One year later, another wing in the same building suffered water damage from a patient who had hit the sprinkler head that was located on the 2nd floor. The water from the sprinkler effected both the 2nd and 1st floor. The project was quickly understood and we had our crews out there within an hour. The facility was comprised of bedrooms, a health clinic, community rooms, foodservice facilities, a community activity room, numerous restrooms and other areas all with saturated drywall and contaminated furnishings. We brought Windsor Laurelwood Hospital back to normal within 3 business weeks.